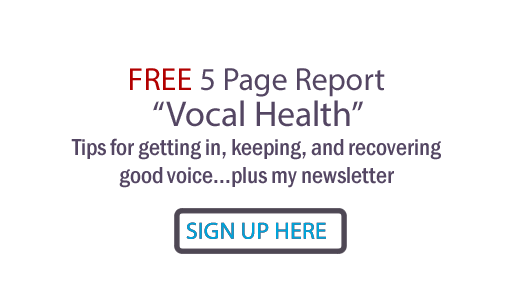 I'm always looking for simplified ways to quickly help you experience correct vocal technique. Sometimes the mind understands but the body feels spastic! The "feeling" of correct breath support and breath control can be elusive. You must at the same time apply the power of the breath AND control that power. If you are familiar with my teaching, you know that support must be applied from the pelvic floor, and that you enable control by keeping the bottom of your ribcage wide. Put your hand on your UPPER (not lower) chest- right below your neck. Place the back of your other hand on your tailbone. Now press your two hands in. You should experience your posture stretching tall, with the bottom of your ribcage widening and your low abs moving in towards your tailbone. Now, do it again as you sound a note. Do you feel the controlled breath power in that action? This may help your muscles memorize the correct feeling of applying controlled breath to your voice. Then you can recreate the action without actually using your hands to press these areas. The object is to become aware of the sensation and be able to do it without thinking.